Manchester Cheese for sale. Buy online at Zingerman's Mail Order. Gourmet Gifts. Food Gifts. Irene Tenenchuk is a website design developer and a concierge in our Business Gifts department here at Zingerman's Mail Order. I must confess that I love cheese, and one of my long-time favorites is Manchester from Zingerman’s Creamery. Normally I will not even look at a cheese made from pasteurized milk, but this one is a rare exception—it is that good. It beautifully showcases the seasonal nature and flavors of the local milk used to make it. 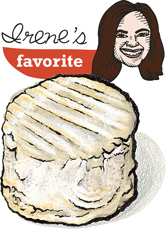 The cheese is soft and lusciously creamy with a mild tang when young, and gets denser and more flavorful as it ages, with a soft, almost runny rind that is delectable. Manchester is amazingly versatile and tastes great with Violet Mustard, whose crunchy texture and sweet and spicy flavors balance the softness and richness of the cheese (we call this perfect pairing The Purple Russian). I use it to add richness to a roasted turkey sandwich on grilled farm bread, with perhaps an avocado spread or roasted piquillo peppers. I also enjoy it as a sweet ending with toasted pecan raisin bread and apricot jam. For a special teat I brûlée it with some sugar and top with macerated blueberries. Like other cheeses, Manchester is best served at room temperature, when its full flavor will come through. Because it's so soft, it will ooze a bit when it's warm. That's normal. Try it dusted with light muscovado sugar then baked into puff pastry and served warm for an excellent hors d'oeuvre. Or offer it up in wedges, topped with toasted almonds, hazelnuts or walnuts. It's excellent spread on ham sandwiches topped with caramelized onions (see the recipe below for our Hamchester sandwich). Heat the olive oil in a heavy skillet over moderate heat. Add the onions and sauté until golden (about 25 minutes). Remove from heat. Place a large nonstick skillet on the stove over medium high heat. Using a pastry brush, brush 1 side of 2 slices of bread with olive oil, and place oiled side down in skillet. Top each slice with 1 ounce of cheese, 1 ounce of ham, half of the onions, 1 more ounce ham, and topped with 1 more ounce of the cheese. Top each sandwich with another slice of bread brushed with the oil, oiled side up. Flip the sandwiches a few times until the cheese is melted and gooey and bread is toasty and golden.